A VPN (Virtual Private Network) routes your internet connection through remote servers, so you can safely browse the web on public Wi-Fi, protect your personal data, and access geo-blocked content from anywhere in the world. 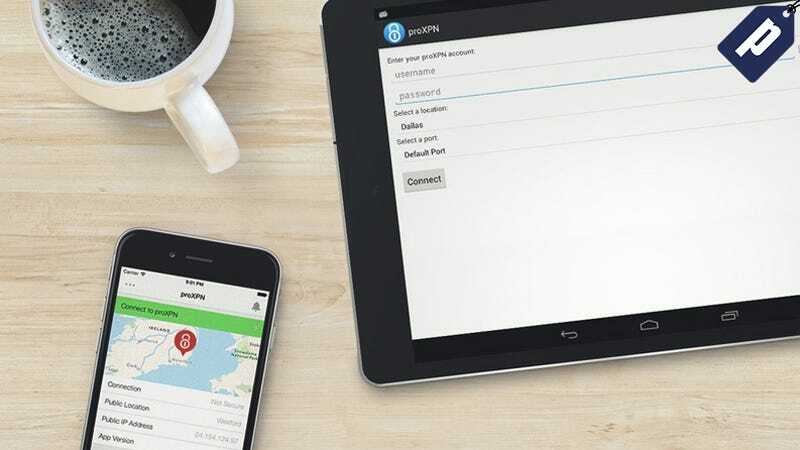 proXPN is one of the best, earning a 4-star rating from PC Mag, and a lifetime subscription is now just $39 - 90% off the original price. proXPN gives you ultimate peace of mind - both at home and on the road – with fully-encrypted, fast servers. Your lifetime premium subscription gets you unlimited bandwidth on their private global server network and complete online anonymity—it even unblocks geo-locked content so you can browse freely around the world. Plus, proXPN never logs your online movements, so no one can ever track you or steal vital personal data. A lifetime subscription would normally cost $375, but Gizmodo readers can get one today for just $39. Hit the link below to learn more.